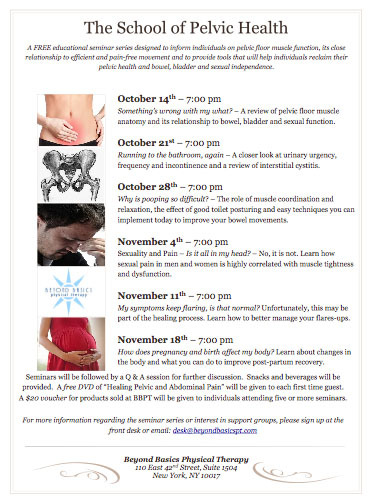 The School of Pelvic Health returns tonight, Tuesday October 21, 2014 (7:00 PM) with a fascinating class entitled Running to the Bathroom, Again! Stephanie Stamas, physical therapist at Beyond Basics Physical Therapy, will discuss the urinary system’s anatomy and physiology. She will then explain what happens when this system is not functioning properly, and she will elaborate upon urinary urgency (“I have to go and I have to go NOW!”), urinary frequency (constant feeling of needing to urinate, even if one has recently done so), and urinary incontinence (involuntary loss of urine). Stephanie will explain the differences between the various types on incontinences, particularly stress, urge, and mixed incontinence. Other topics that will be addressed are urinary tract infections (UTI), what increases the likelihood of developing a UTI, and how to distinguish between pelvic floor dysfunction and a UTI. Stephanie will also address INTERSTITIAL CYSTITIS (IC), a common diagnosis that patients self-diagnose on WebMD, and the difference between pelvic floor muscle dysfunction, which often presents symptomatically as IC, versus actual IC. Male pelvic floor issues will be addressed as well! Stephanie will discuss prostatitis, prostatectomy, and benign prostatic hyperplasia (BPH). She will explain how physical therapy, including bladder retraining and irritant avoidance, can help address the aforementioned diagnoses. Men and women alike stand to benefit tremendously from the information Stephanie will share with the class. The class will conclude with a Q and A session, and many yummy, healthy treats will be available for participants. Furthermore, a free DVD of “Healing and Abdominal Pain” will be distributed to all first time guests. We look forward to seeing you on OCTOBER 21 AT 7:00 PM! Please email any questions or comments to us at desk@beyondbasicspt.com.